A new 2-player puzzle game is coming to the Nintendo Switch. Developed by Baltoro Games, Flowlines Vs. is inspired by classic video puzzle games. Up to 2 players can play together in Flowlines Vs and it will be available to play on Switch come January 25th. We have an overview for the game below as well as a trailer. WHAT IS FLOWLINES VS. ? If you like classic video puzzle games for 1 or 2 players we have a lot of stuff for you. 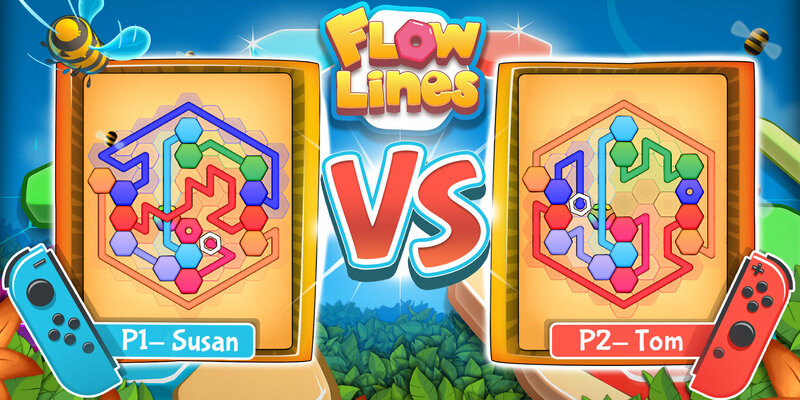 Inspired by the very best of the genre, Flowlines Vs. aims to become one of the most important party games out there. We want players to solve puzzles, to compete with each other doing so, and to play – everywhere and with everyone. Pair up all the matching sockets on the board by drawing continuous lines, without crossing over other lines or branching off. Cover the entire board while connecting all of the sockets. Although keep an eye out for stages with a time limit, or a limit on moves you can make. • Over 400 levels you can play in single player mode or versus multiplayer mode. • Soundtrack emphasizing the game’s atmosphere. • 50+ great graphical themes. • Easy to play and hard to master. • Both adults and children can pick the game up quickly, thanks to the Intuitive tutorial. • Play any way you like – Joy-Con TM, Pro Controller TM, using the touch screen or in handheld mode. • Get your hands on special rewards available through our Achievement System. • 8 supported languages – English, French, Spanish, Italian, German, Portuguese, Brazilian, Turkish. WHAT IS THIS VS. PUZZLE GAMES ABOUT? The aim of the Versus games is to defeat the opponent sitting next to you. The genre Vs. Puzzle is based on improving skills without direct confrontation with an adversary, for example solving the same task. Vs. Puzzle games are a subset of Action Puzzle or Arcade Puzzle videogames. The advantage of Vs. Puzzle games is the ability to develop thinking skills and strategic action.